Coach Justin Smith said, “With an unbeaten district record, we are in good position as we go into last half of the season. Of course we still have to play each of those teams again. Eagles begin the second half run with home game tonight against Warren County at 7 pm. They then travel to Cookeville and Soddy Daisy on April 18th and 23rd in what should be tough road games. Rhea County dominated the field against Soddy with 33 shots on goal and gave up late goal against Soddy near half to make it a close 2-1 game despite fact Rhea County had dominated possession. Carter White had both goals for the Eagles in the first half. Carter scored two goals about three minutes apart. He scored first goal at 20:07 mark and second goal at the 16:57 mark. Soddy scored with 1:37 on the clock when Payne Morgan made the block of a goal try but ball slipped off his hands and Soddy finished for a gola and made a game at the halftime juncture. Rhea County kept up pressure on second half and it was Justin Price with late goal to give Eagles the 3-1 final margin. 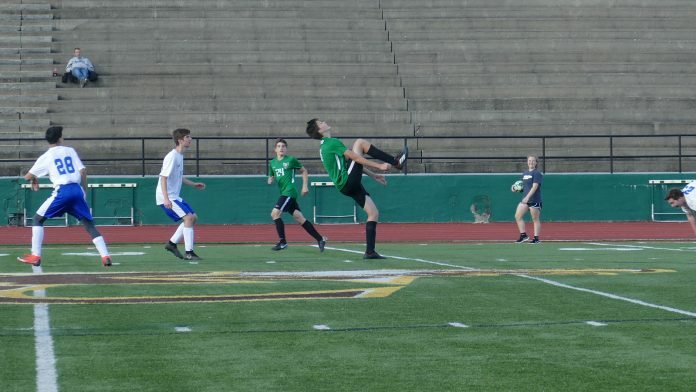 Evensville, TN — The Eagles dominated the game with 25 shots but only one found the net on a goal by Justin Price in the second extra period as Rhea County defeated Warren County 1-0 at home.